With all this talk about the re-release Sand Rover it got me thinking about a project that had been in my head but just like the decorating in my house had been confined to the back burner for years! 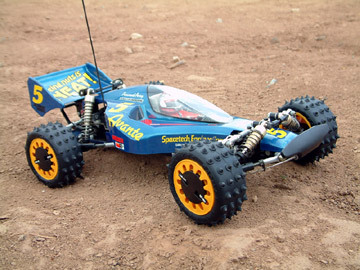 It's arguable that the new re-release Sand Rover isn't even a re-release and just another model by the same name on a modern chassis. Like the new Holiday Buggy though I don't personally think this is a bad thing if the looks are right as it makes for a more rugged, reliable and fun platform than the old chassis. The problem though is the looks and for me the Sand Rover has always been logically paired with the SRB chassis. Most of the sand dune buggies of the era and many today are based on the VW Beetle floorpan and running gear. 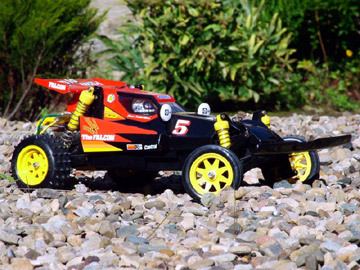 Having developed this chassis to look so real for the Sand Scorcher why didn't Tamiya pair the Sand Rover to this chassis? It beats me, and as you can see from the 1:1 photos , our Sand Rover is pretty realistic, it just needs those trailing arms visible at the front end and an engine/rear cage. By installing a Sand Rover shell onto the SRB chassis you end up with a model that looks far more realistic and should run really well, be reliable, fast and rugged! I'm not the first to do this but this article explains my approach and shows you how easy it is to do. First up I checked the wheel base for the right width and length and guess what, it's perfect. The Sand Rover shell is pretty wide which makes it look short but the SRB chassis is just right, it is obviously the same as a Holiday Buggy anyway. Luckily I had a very old and very abused Sand Rover chassis stiting ready to cut up but you could always fabricate some sides to your SRB chassis to form a tub or even cut up a modern DT-02 Holiday Buggy/Sand Rover chassis potentially. As you can see from the photos it's a simple case of cutting off the back end and front end. All we need is the tub which can sit on the SRB chassis. Mounting the battery was pretty easy thanks to some modern (Baldre/Durga) body mount posts secured through the bottom of the chassis. The steering servo was mounted using standard servo blocks drilled and secured through the bottom of the Sand Rover tub. You could even get away with servo tape/pads here. The front suspension in standard form is a little too wide at the top to sit under the bonnet but this was easily solved, all I did was file back the front mounts slightly as shown and remove the rubber bushes from the top damper mounting. This allows the shocker to sit a few mm more inboard and a countersunk M3 bolt and washer hold it in position nicely. This bolt is threadlocked in but a longer bolt and M3 nyloc nut on the inside would work well. The front body mount is a simple bent metal hook that only took a few minutes to create. I used a screwdriver to form the bend in the vice and it hooks nicely onto the upper of the 3 front cross tubes. The rear suspension is easy enough too. Having cut down the standard roll bar/body mount you can still mount the shocks in the normal position. I've used some M-03 Mini coilovers here because we've lost the SRB torsion bar but I plan to change these soon for longer SRB shocks with a coilover conversion.I reckon there's room for a taller shock mount in here to give more movement and some front re-release shocks should work well and look good. You could actually use standard Sand Rover body mounts at the rear but Ifind them hard to work use so i've improvised with some machined brass inserts and again modern buddy body mounts secured through from underneath. The bling alloy parts are courtesy of J-Man (thanks so much John) and they bolt straight on. I can't take credit for these parts, handing over the cash and bolting them on was the easy part but boy is it worth it? These touches make such a difference and bring it to life. 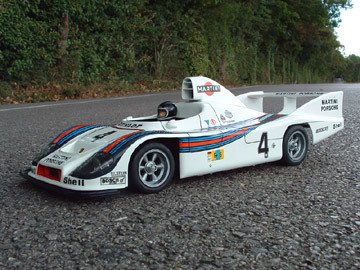 He sells a range of parts including the detailed engine you see here and the quality is second to none. Finally the chassis was sanded and finished off in satin black to give it a fresh new look. All that remains is to sit back and enjoy it! Hi that looks great. Really good build, but would it work with a holiday buggy shell instead of the Sand Rover?? Thanks for your kind compliments. The wheels are allow wheel covers from ebay so this is their natural colour. The body was first painted yellow, then Candy Lime green and then 2 coats of clear lacquer which has been polished. 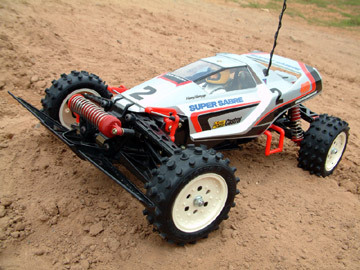 I was searching photos of Sand Rover after I decided to buy one. This is the most beutiful Sand Rover I've ever seen..it's the master piece. Please let me know if those silver colored wheels are colored by yourself? If so.. what color spray did you use? After colored the body to green, did you use the clear spray as well? it's so shiny.. This write up is great, you should really send your modle to R/C Magazine. 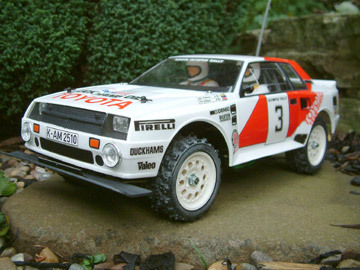 Love It, and the Rover looks Great I want one! My word that'sh FANGTASHTIC!! You are in the wrong job Stevo. You should be helping me with my queshtions ;-) Always a pleashure to shee your work young fella.